Loc8tor uses a blend of exciting new technologies and traditional radio frequency (RF) technology. Both Tags and Handheld transmit and receive radio signals. The Loc8tor Handheld picks up this signal translating it in to clear audio and visual prompts to guide you in the right direction or warn that an item has gone astray. Audio beeps are also emitted by the Tag to help you home in on the items specific location. Up to 24 Tags can be monitored in Locate or Alert modes. Loc8tor has a maximum range of 183 metres / 600 feet. This is based upon an outdoor application with clear line of sight. Obstacles such as walls, floors, cupboards and other people will reduce the maximum range proportionately. The Handheld guides you to within 2.5cm / 1” of your possessions. 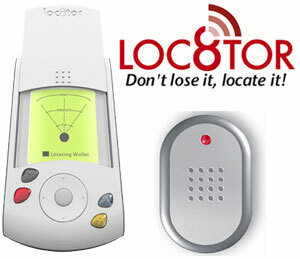 Loc8tor is fully directional and will provide guidance left and right, and up and down. In practice one attaches the tags to important objects by way of key fobs, adhesive backing or containment, and then name the tags one by one through the interface on the handheld finder. When you lose something, you press a button, select the thing you want to find and the unit starts bleeping: the intensity of the sound, and the bars on the screen are proportional to your proximity to the lost item. Because it’s directional, you can turn around slowly in a circle, and find an initial direction, then repeat this a few times and you normally find the thing you are looking for. Where this product fails miserably is in the interface. The arrangement of buttons and screen menus shows a lack of thought or design process: they are inconsistent, badly labelled, overly hierarchical, highly modal and very prone to simple errors. (...) Given that the act of losing something – or remembering to take things with you – usually happens in moments of stress: walking out the door, gathering things from around you, getting off the train, this interface is overly complicated for its intended use. Why do I blog this? because this tool is a - sort-of - weak signal of applications that may populate the Internet of Things, but why do we need yet another device for that matter?